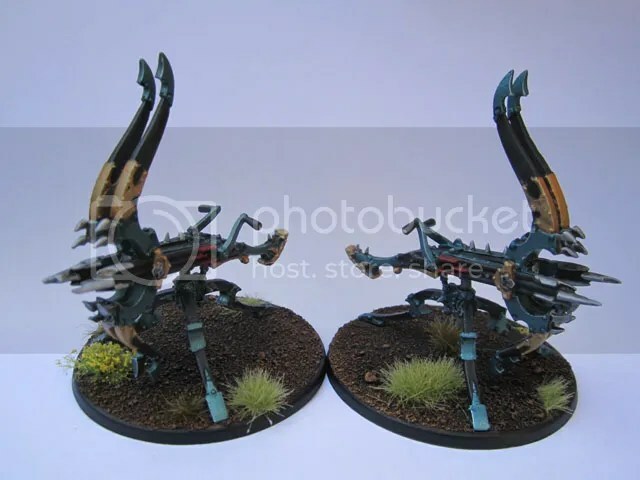 Dark Elf Repeater Bolt Thrower & Secret Weapon Barriers | Azazel's Bitz Box. Dark Elf Reaper Bolt Throwers. Again. 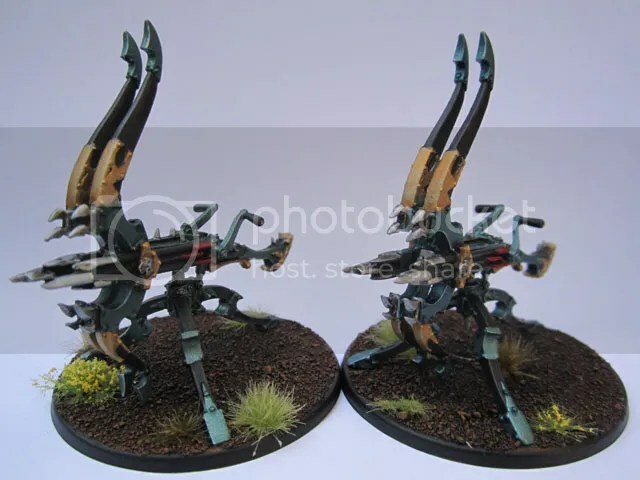 A pair of metal GW Dark Elf Repeater Bolt throwers. I got the pair cheap off eBay already assembled and primed, so the day after finishing the treeman last week, I decided to spray them with my two custom sprays that I got made for my DE/Twilight Kin – since I no longer play WHFB, I’m happily basing everything for Kings of War with it’s more relaxed basing options – so round 40mm bases from Proxie Models to the rescue. By the end of the day, they were all but finished. Of course, I need to do the crew sometime soon as well… I guess. Over the Christmas-New Year period, I picked up a couple of sets of Secret Weapon Miniatures‘ “Bag O Crap”. Which is essentially miscasts and bits that don’t make their quality control standard. I’ve half-written a review of them, so I’ll save the detailed commentary for later, but suffice to say that a couple of other resin companies might want to take note of what Quality Control means. Puppetswar in particular. These were done in Mid-Jan, but I didn’t get a chance to photograph them until now. These painted up nice and fast, and (will) look good on the tabletop. I’ll probably need to buy a ton more of each, though… I went for a bright orange plastic that had both been sunbleached and dirtied up in use for the Jersey Barriers. Despite being pretty small and simple, I’m quite happy with how they turned out. These barriers will work nicely in everything from moderns to zombiepocalypse to 40k and everything in between. This entry was posted in 40k, Fantasy Gaming, Kings of War, Modern Wargaming, Sci-Fi Gaming, Wargame Scenery, Warhammer Fantasy - 9th Age and tagged 40k, Dark Elves, Proxie Models, Secret Weapon Miniatures, Warhammer Fantasy - 9th Age, WHFB. Bookmark the permalink. ← D&D Monster Manual 3 : Treeman/Treant – aka Reaper Bones 77184: Spirit of the Forest – Speedpaint! The palette on those bolt throwers is very nice. My only concession to fantasy gaming is my 10mm stuff. We use the KoW ruleset and it works very well (we changed inches to cm and it all worked out fine). I have Orcs and Goblins (well, more a Mordor sort of “Evil” army), but I also have a unit or two of Dark Elves that I want to add at some point. I do love painting 10mm. Im working on a large number of small terrain elements at the moment. Many people skimp on the terrain part of the hobby even though arguably its more important than painting the miniatures, so its nice to see someone else putting in the time. I have yet to buy from Secret Weapon, but its good to hear positive things about them. Sounds interesting, I’m a bit stuck on 28mm. I just enjoy the scale in terms of painting the models so much more. My one foray into 10mm (Romans) failed almost as quickly as it began, though I absolutely see the appeal of huge armies filling the table for an epic battle. 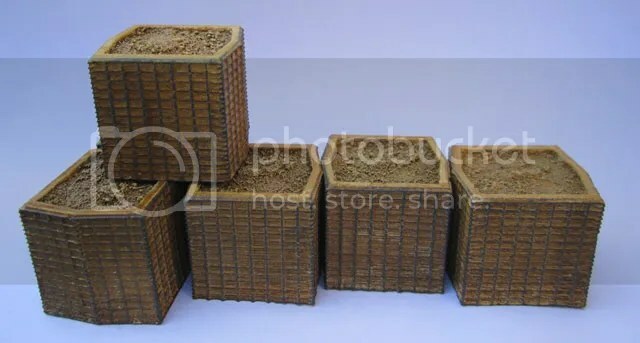 I’d quite like to not only see your 10mm forces, but also see what you’ve done in terms of terrain. As my post from tonight shows, I’m happy enough to work on the stuff, but it can become a bit of a drudge at times, so it’s always good to see something inspiring. Pingback: Inconsequential Things | Azazel's Bitz Box. 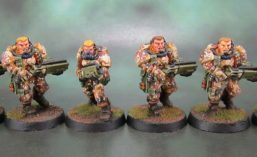 Pingback: Another Tangent – Chaos Dwarf Colour Schemes | Azazel's Bitz Box. Pingback: From the Painting Desk #8 – How should I base this Stone Thrower? | Azazel's Bitz Box. Pingback: Secret Weapon Miniatures’ Gothic Tank Traps (Dragon’s Teeth) | Azazel's Bitz Box. Pingback: Morathi: Dark Elf Supreme Sorceress (Chris Fitzpatrick, 1997) #Fembruary 2019, Neglected February 2019 | Azazel's Bitz Box.